My spending freeze is over, and I can honestly say that I haven't been tempted! I am, however, ready to add some cute new summer clothes to my wardrobe! Yes, the first day of Spring was last weekend and I'm already thinking about summer! There are great sales going on right now at some of my favorite stores, so it's definitely the right time to shop! Loft was offering 40% off and free shipping, so I placed an order on Monday. I decided to hold off on buying too many new pairs of shorts until I lose a few more pounds, but I did pick up these lace shorts. Since I wasn't ordering any other shorts, I decided to give these rompers a try. I also picked up a few sleeveless tops. Banana Republic and Gap were also having a 40% off sale, so I ordered some shirts and a few dresses. I'm debating about whether or not I should order these shoes. I love the red ones I posted a few weeks ago, but if I'm going to get a new pair of wedges, black seems more practical (especially after looking at everything I ordered - apparently black is my new favorite color ;). I love online shopping, but it's hard to know how something will look on you without trying it on, so I'll update on items I keep/return once everything arrives! 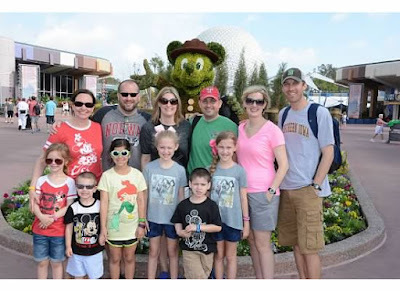 My sister's 40th birthday was over Spring Break, so we decided to surprise our kids with a trip to Disney World to celebrate! I'm usually really bad about keeping gifts secret, but I somehow managed to keep the secret since last August! Of course, all of the secrets and hiding things I purchased for the trip also meant that I forgot about the Unofficial Guide to Disney World book that I purchased until the day we left, but it was worth it to see their faces! I created a Scavenger Hunt for the morning of the trip to reveal the surprise. We were leaving on a 10:00 flight, but a news story from the day before (my brother was interviewed!) had us all a little worried about the lines we'd be facing at the airport so we decided to leave early. Okay, so not really that early considering most people plan on being at the airport two hours early, but when your husband travels all the time for work you think arriving at the airport anything more than an hour early is EARLY. We planned on leaving at 8:00. so Michael and I got up at 5:45 to shower and finish packing. We were finished by 6:30 and were more than a little excited to surprise the kids, so we woke them at 6:45. Sophia was more than a little annoyed when we came in singing, "It's Spring Break! Time to get our staycation started! Who's up for shadow puppets?" I probably should have prefaced this by saying that the kids were planning for a staycation, complete with shadow puppets, dying flowers, a trip to Dave & Buster's....exciting stuff! I say that in jest, but Carter was actually pretty disappointed when he thought we wouldn't be able to make shadow puppets. Silly boy! Anyhow, back to the story. Once they realized that we were going on a trip, they were so excited! Unfortunately, since we woke them up so early we had a lot of time to kill. I turned on the Peanuts movie and waited for their next surprise to arrive. Finally, at 7:45 there was a knock on the door. I played it off that it was the neighbor boy coming to play and sent them to answer the door. 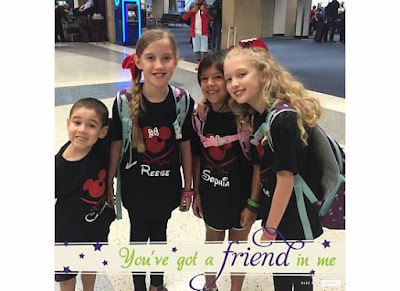 Again, it took them all awhile to figure things out ~ Sophia and Carter were expecting their friend to be at the door, and the twins thought we were just taking them to the airport. Too many surprises for one day! Once everyone had settled down, we Ubered to the airport. The lines weren't nearly as scary as they were in the news story so we made it through security pretty quickly and went to Fridays for breakfast. 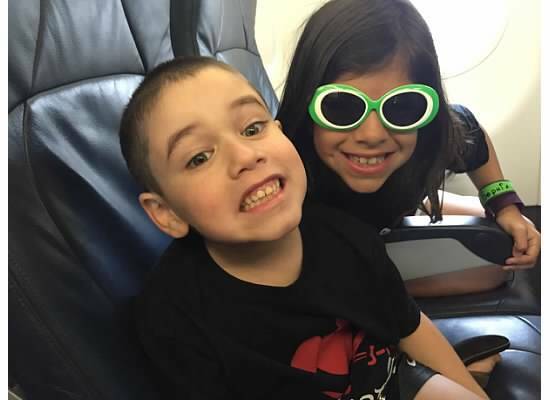 The flight was pretty fast and the kids were all great! My only complaint, and for us it really isn't a complaint because we had assigned seats when we arrived at the airport, is that the airline oversold the flight (for Spring Break, really?) so there were several people that didn't end up with seats. The first day was spent swimming in the pool at the hotel, and that night we took a water taxi from the resort to Disney Springs (if you've been to Disneyland, this is their version of Downtown Disney). It was wall-to-wall people! There were pockets where you had some room to spread out, but it was definitely nerve-racking walking around with four kids and tens of thousands of people. Actually, I don't really know how many people were there, but I do know that there were 50,000+ people at the Magic Kingdom the next day, so it wouldn't surprise me if the numbers at Disney Springs were that high. We went into the Christmas store before heading to dinner at Portobello (good Italian food). I'm so glad we decided to make reservations because they told the lady that checked in ahead of me that it was a two hour wait, and shortly thereafter they stopped taking walk-ins. Unless you're dying to eat at one of the restaurants I'd skip Disney Springs. We signed up for the dining plan, so booked reservations for many of our meals ahead of time. I'd definitely recommend the dining plan if you are planning on eating at any of the restaurants. You do have to pay the tip, which usually ends up being about the same amount a family of four would pay for a normal dinner out, but it's worth it. You get plenty of food, and if you're doing a character meal, there is plenty of entertainment. Just make sure to check on the number of meals you get charged for at each restaurant - my brother and his family ate at Le Cellier Steakhouse in Epcot and were charged two table service meals per person. Most of the Quick Service restaurants don't take reservations, but Be Our Guest does (at least for breakfast, which is when we went). Even though it's considered a QSR, you get a ton of food. 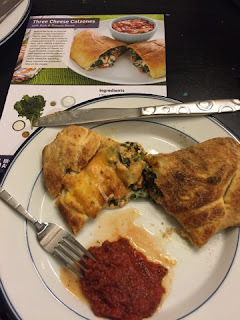 I had eggs florentine in a puff pastry shell with ham and roasted tomatoes (so good!) and they brought us an assortment of pastries to share. The other days we used our QSR meals for breakfast at the hotel. For character meals, we had lunch at Crystal Palace one day and Akershus the next. Both were really good. Crystal Palace was a buffet lunch with Winnie the Pooh and friends. Akershus is a sit down (buffet for appetizers) lunch with the Princesses. I had the Bassert Biff (braised beef) - so yummy! I'm not sure if this usually happens, but there were five princesses at our lunch. We got to meet Ariel, Aurora, Belle, Cinderella, and Snow White! For dinners we ate at Portobello in Disney Springs the first night, Biergarten in Epcot the next, and Boatwright's at our hotel the third. Biergarten was part of the kids' final surprise - their other cousins were at Disney World too, and we were having dinner together! For snacks, we got a Dole Whip at Aloha Isle (refreshing), Mickey ice cream bars, Mickey ice cream sandwiches, and a huge pulled pork slider (there was a stand in America at Epcot - definitely worth getting if you see it). We loved having the magic bands! It was so nice not having to worry about carrying a room key, credit cards, cash, park tickets, etc. The magic bands eliminated the fighting between Sophia and Carter over who would open the hotel room door ~ one of them would open the door, go inside, and then the other one would open the door and go in. We were able to connect the magic bands to a credit card, so whenever we needed to pay for something we scanned a band and entered the pin. So nice! The FastPass+ system is great ~ if you're staying at one of the parks, you are able to choose three fast passes per day ahead of time. I was disappointed that they had to be at the same park, because there were a few of the parks that only had one ride/attraction that we needed fast passes for, but you couldn't mix parks. The fast passes allowed us to jump some pretty long lines (I think the longest we waited for a ride was 20 minutes with the fast pass, without it would have been over an hour). Unfortunately, after almost every ride the kids would say, "Let's do it again!" and we'd have to tell them no because the wait was too long. There is an option to sign up for additional fast passes after the first three are used/expire, but we didn't have much luck with it. There was plenty of other stuff to do while there, but it was just a bummer that we didn't get to ride more rides. We spent three nights at the Port Orleans - Riverside, and then we transferred over to the Loew's Royal Pacific. We were disappointed when we checked in to receive a room key and individual express passes for each of us. The magic bands are so streamlined! We purchased lanyards in the hotel gift shop to hold all of our stuff and moved on. If you're staying at a Universal resort, you get to enter one of the parks an hour early. The only thing that's open is the Harry Potter section, but it was totally worth it because we got the kids their wands (we did the interactive wands at $47 a piece ~ expensive, but worth it to get to do magic at the parks) and we had breakfast before the rest of the park opened. The express pass I mentioned in the first paragraph is so much better than the Disney FastPass+! In fairness to Disney, they have too many resorts to allow all of their hotel guests unlimited fast passes ~ the lines for non-Disney guests would end up being the short ones! The express pass allowed us to jump the line on EVERY ride as many times as we wanted. Hotel guests get them included with their stay, but you can also purchase one at the park for $90 or more per person/day! I think the longest we ever waited for a ride was 25 minutes, and that was only because the ride malfunctioned and they closed it briefly. If you're planning on going, stay at one of the hotels ~ you can walk to the park in less than ten minutes and the express pass is totally worth it ~ when the kids would say, "Let's ride it again!" we just jumped back in line! Overall it was a great trip! We loved both Disney World and Universal Studios, and can't wait to go back! I know that I left a lot of information out, so if you have any specific questions post them below. Spring is here! I got my first pedicure of the season a few weeks ago and I'm ready for sandal season! For now I'll have to stick to the sandals I already own, but I thought I'd share some of my favorite options with you! Most days during the summer I just throw on a pair of flip flops and go. I mean, you really can't go wrong with a basic pair of flip flops. For years it was my Reef Butter flip flops, which had a thicker sole, but they had to go and ruin them with the Butter 2 and Butter 3, and now there is a Butter Cushion....they're just not the same. I purchased similar ones to these last summer (I actually got the Ginger, but they seem to be a little harder to find and the Glitz look almost identical). Just a basic black flip flop, but a much better construction than the $7 ones you can get at Old Navy. I tend to wear more neutral colored clothes, so sometimes it's fun to add fun colored shoes. I love my Toms Desert Wedges, so I'm thinking I may need to try these! Aren't they fun? On days when I want to be a little dressier, but would rather be in flats I wear my Sam Edelman Gigi sandals. Right now I have them in black and leopard, and will soon be adding the saddle brown to my closet. I'm loving these sandals from Target! They remind me of my Sechelles, but are a third of the price! If you have read my recent blog posts, you know that I won't be buying anything new before April, but it's fun to "window shop," and I love having the chance to shop for you! I've linked some other fun options below! What are your go-to sandals during the summer? When we built our house we weren't crazy about the upgrade options for lighting, so we went with the standard lights throughout. 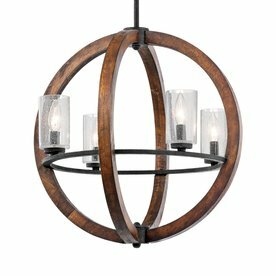 They are nice, but eventually I'd like to replace at least the ones in our foyer, kitchen, and dining room, so I thought I'd share some of my favorites here. Maybe it will help inspire you! I have this light sitting in our guest room closet right now. When I got it I planned on putting it in our kitchen nook, but it would also work in our dining room, the study, or the guest room. I just need to decide where it's going to go and put it up! These are the pendant lights I'm thinking of putting in our kitchen. This post was originally titled "Tuesday Ten," but I couldn't just pick ten so it became twelve. And just for fun, I linked some other options below (maybe I should have called it twelve+). I'll update with pictures once I finally hang our Antique Farmhouse chandelier and anything else we end up getting! I've given up shopping for Lent. Yes, that's right I am not allowed to shop for anything other than things we truly NEED until Easter (six days after Easter if you want to get technical ~ I decided what I was giving up a little late). I realized that I had been spending way too much money these past few months, buying things just because I wanted them, so I decided to take a break from spending. Just because I'm not shopping right now, doesn't mean I can't help you shop, right? After I took our Christmas decorations down, the house was just depressing. Now don't get me wrong, I was ready to take the decorations down (I even did it before New Years Day this year), but when you go from having decorations everywhere to having nothing it's still kind of sad. That was about the time when my spending spree started. Now I'm not suggesting you go crazy like I did, I'm just giving a few suggestions on things you can add that will bring life to your house! I started by bringing in greenery. I'll admit, most , okay all, of the greenery is fake (I don't think I'd be able to keep anything alive! ), but they're all good fakes. ;-) I picked up a few topiaries and added moss to my hurricanes and lanterns. I have had the most luck in finding realistic looking greenery at Home Goods. Hobby Lobby has several options as well, but they were pricier than the ones I've found at Home Goods and, in my opinion, didn't look as realistic. 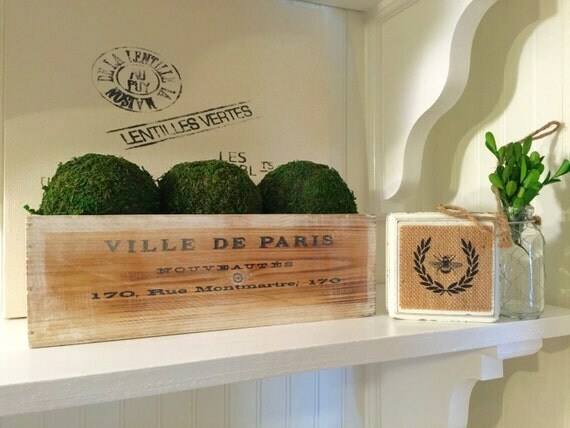 I need something for the center of my dresser for underneath the tv and I think this distressed wood box and moss balls from Simply French Market will be perfect! I'm also thinking of adding a wreath to the vintage window in our room. 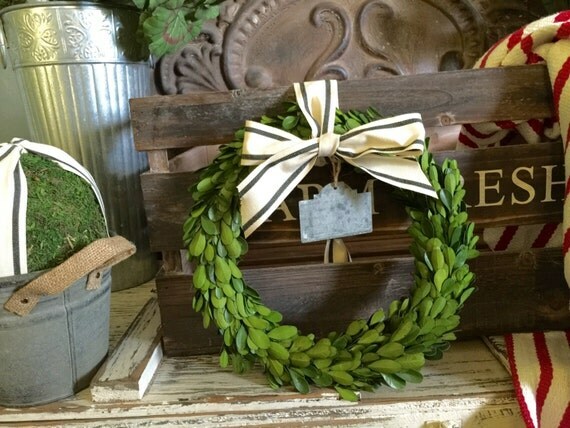 I think that this boxwood wreath will be perfect! Once my spending freeze ends I think I'll be ordering them both! Again, these can be fresh or fake. I have found some really good fakes at Home Goods! I've also found a few arrangements and individual stems at Hobby Lobby. They have sales on floral and greenery all the time, and they always have a 40% off one item coupon online, so it's a good place to look. I have fake hydrangeas in my dining room right now that I got from Hobby Lobby on sale. Pier 1 has some good options for floral as well. They have some beautiful floral stems (I'm loving the peony sprays - I may be replacing our hydrangeas with pink peonies for the spring and summer) as well as arrangements, though many of their arrangements are pricey. A few weeks ago I started buying fresh hydrangeas at Central Market. 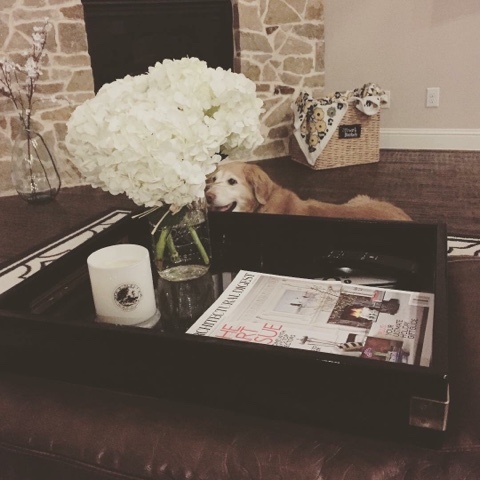 I loved having fresh flowers in my house! And then I gave up shopping so I had to give up my flowers. You can bet that on April 1st I'll be buying some fresh flowers! You can see some stems I purchased at World Market in the background along with my floral Vera Bradley throw (I guess it qualifies as "fake" flowers ~ ha!). Changing out your pillows, throws, table linens, and other decor items is another easy way to redecorate for the season. Choose light and bright colors, think whites, pinks, yellows, and neutrals. 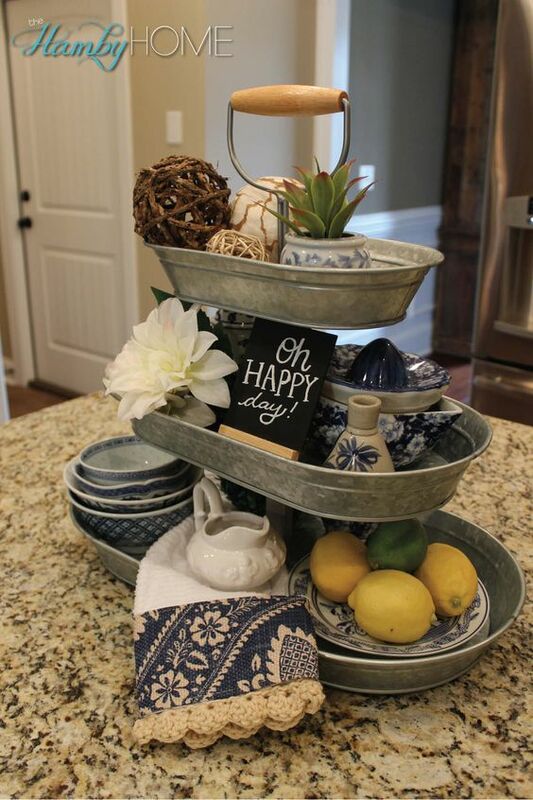 If you have a tiered tray you can change up what you display depending on the season (and bonus: it works great as a serving piece!). Here are a few of my favorites from Pinterest. 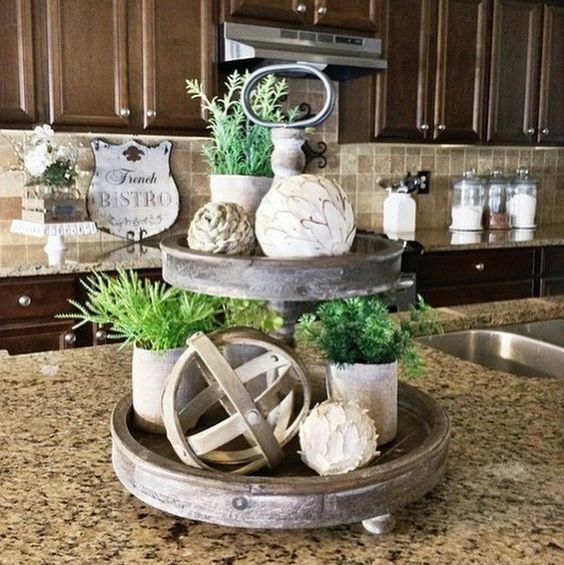 I actually have one tiered tray that I purchased from World Market a few months ago and another from Pottery Barn that is still sitting in a box. I ordered it before I gave up shopping, but it arrived after and I've been going back and forth between suffering from buyer's remorse and the overwhelming desire to decorate my new tiered tray! I got it on sale and there was free shipping, so the price was great, but do I really need it?! I'm hoping to figure out the answer to that question before the return policy is up! 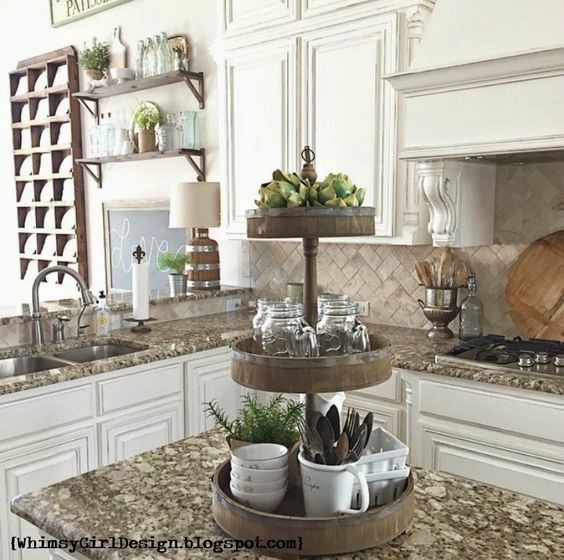 How do you change up your decor for Spring? Last Thanksgiving I received a coupon in the mail for $20 off my first Blue Apron box. 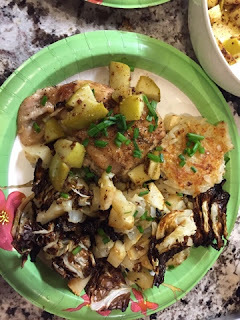 Michael and I had been trying to cook more, and eat healthier, so we decided to give it a try. We love it! They offer two different plans: a two-person plan and a family plan. The 2-person plan includes three meals per week at a price of $59.94. It works out to about $10 a meal per person. 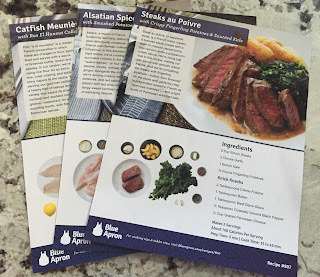 The family plan (serves 4) offers two different options, either two meals per week for $69.92 or four meals per week for $139.84. That works out to about $9 a meal per person. 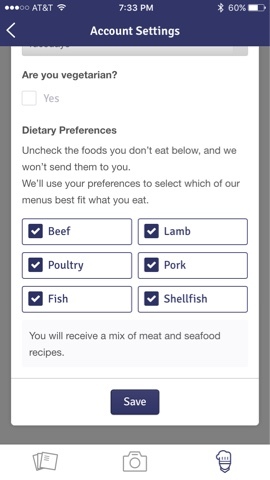 When you first sign up you fill out a questionnaire about the types of meals you want to receive. You select whether you're a vegetarian (with the 2-person plan they have six recipes per week to choose from, though not all combinations are available, and three of those are always vegetarian options), and then you can uncheck the meats you don't eat. I'm trying to be more open to trying new things so I haven't unchecked anything on mine. However, as I said, you do have the ability to change your menu and receive a combination of vegetarian and regular meals so I've done that on occasion. When you sign up, you get to select your delivery day. We chose Tuesday. The contents of the box are in an insulated liner with ice packs, so if you're not home when the box is delivered it's okay. We had a box delivered in the morning that I didn't bring inside until late afternoon, and everything was still ice cold when I unboxed it. 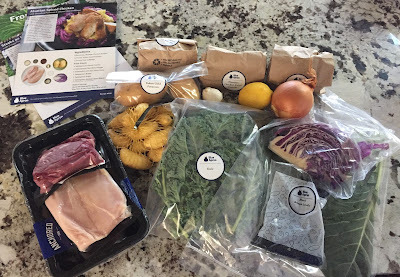 It's nice because you have about nine days from your delivery day to actually make all the meals, so there isn't necessarily a concern about picking just the right day....if Michael is out of town I usually wait until the weekend to cook our meals. Included in every box are recipe cards that give you step by step instructions. If you're still a little unsure of what you're doing, they have videos on their website! If you are considering getting the meals, you have to be willing to do all of the prep work. The vegetables aren't precut (they wouldn't last as long if they were), so there is a lot of peeling, chopping, and dicing involved. I've gotten really good use out of the glass mixing bowls I got for my wedding (I linked similar ones below with a few other must haves). Prep time for each meal is usually 20 minutes or less, so it's not like you're spending hours in the kitchen, but these aren't meals that you can just throw in the oven as soon as you get home from work. We have a pretty stocked pantry, but to cook Blue Apron meals the only things you need to have on hand are olive oil, salt and pepper. Everything else comes preportioned, either in a sealed bag or in small containers. Each delivery comes with separate bags of "knick knacks." This can include butter, ginger, spices & seasonings, sauces, etc. 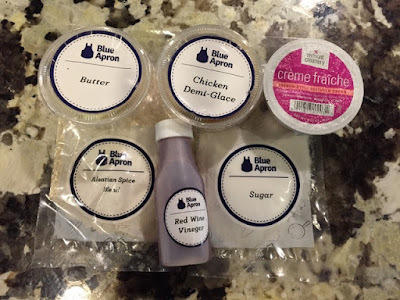 Here are the knick knacks for the Alsatian Chicken that came with this week's box. When we first started receiving boxes we got a box every week. For the first two months we did this and only ever threw away one meal, and it wasn't because we didn't like it, we just ended up eating out and didn't get a chance to cook it. After that Michael started traveling more frequently and it just didn't make sense to get a box every week. 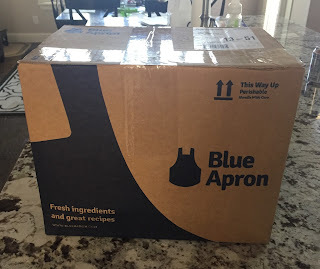 It's nice because while it is a subscription service, you can skip meals for weeks at a time and you only ever pay for the boxes you receive, so you aren't wasting money. I love it because it's gotten me to be more adventurous with the foods I eat. 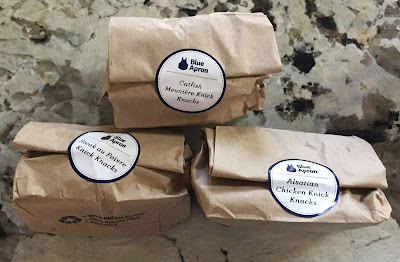 I never thought I liked lamb, but one week we got lamb burgers and they were really good! I've tried celeriac, Brussels Sprouts, kale, rainbow chard, collard greens, beets, freekah, farro, and the list goes on. I've liked everything (some things more than others). If you'd like to try it let me know. Every once in awhile they give me free meals to share with friends, and I'll be happy to share with you!